I'm away all day today - so that's why I'm posting this really, really early. Thanks for playing everyone! See you next week - until then check out the links below. 31. Tink *~*~* wuz here! you are early, I have to agree with you there are a lot of yellow flowers this year, has it always been this way? Every one of these pictures is a winner! Very beautiful. I had some trouble leaving comments on a couple of participants' posts today (such as performance espectacular). After word verification, there seemed to be no place to click to publish the comment, so none was published. I love golden colors, I was so pleased to discover this photo thread! I hope to become a regular contributer. My first contribution is from last fall, beautiful folliage colors from Old Strubridge Village. Hi, Happy Mellow Yellow Monday to everyone. 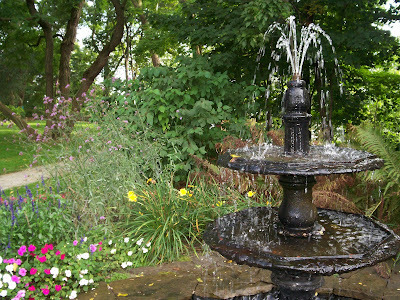 I love the flower arrangement and fountain in the pictures. 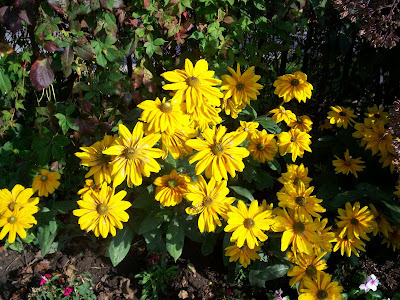 My post today is Golden Candle Flowers. Yellow gorgeousness in such a pretty garden! Such beautiful gardens! I especially like the second photo with all the accentuating colors. Well done! I've added my post to Mister Linky. Happy MYM! I really love that second shot!! 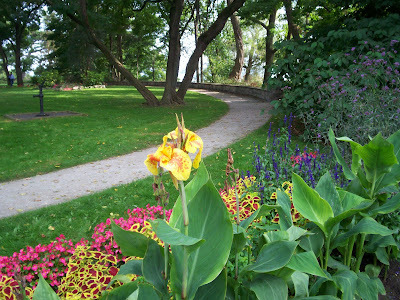 I'm impressed that the gardens still look this healthy in October! Yes, there are a lot of yellow flowers. Here where I live, there seem to be more of them in the fall. Lovely sunshine days full of flowers. Your shots are ALL beautiful! Nicely done. Cool lovely yellow flowers. This is really great garden. MYM Entry Here! Coleus is one of my favourite plants and yellow one of the best garden colours. Thanks for your yellowness! Very elegant fountain. I posted a yellow iris today, too. Beautiful place for a walk and what lovely yellow flowers!! I'm a little late...okay, a whole lot late. :) I hope you can still visit. Your flowers are beautiful, great yellows. No flowers for me this week but a few touches of autumn. Lovely yellow flowers. It's spring here in Oz. Beautiful Flowers! Have a mellow Monday! I'm back to apologize for linking in 3 (!) times. The first two linked to my Sunday post by mistake (no yellow there, just shadows). Third time was the charm, but—again—sorry about that. 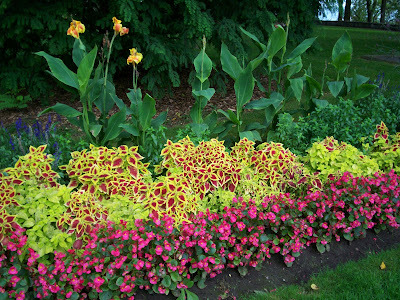 I think I like #2 best, with the coleus leaves and their splash of yellow. Nice ones. Great pictures. Yellow is the new black. these are amazing pix! wish to go walking there! yellows are always beautiful! and these are awesome photos! Happy MYM, Drowsey Monkey, and thanks for hosting it. I love your fountain, and the flowers in the fountain picture. My MYM has water too, but not a fountain. I really enjoy the photos in your new blog, Drowsey. I love the road set at the of the park and green leaves touching the road...I wish I am walking on the road. I enjoy the photos shown here...mellow yellow monday...it is good one... thanks.